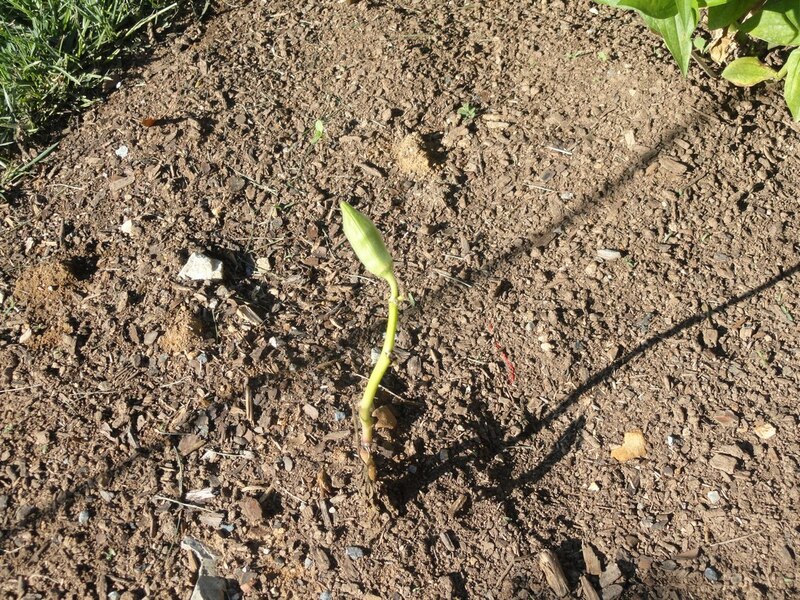 An okra plant will survive. A few weeks ago, we ripped up our raised vegetable bed to install a test plot of buffalo grass. None of the summer vegetables had done very well in the raised bed this year. I'm not sure why. Maybe the soil (purchased from a nursery last year) was too heavy. Maybe I didn't fertilize enough. Maybe the dirt in the raised bed just cooked to an unfavorable temperature in the 100+ degree heat we had earlier in the summer. Meanwhile, the tomato plants growing right in the clay soil next to the raised beds were thriving. So I decided to try to transplant the two biggest okra plants from the raised bed to the clay soil. I had not gotten any okra at all from the raised bed this year. Most of the plants refused to grow. But these were the best of the bunch. They even had managed to create a couple of flowers by transplanting time. 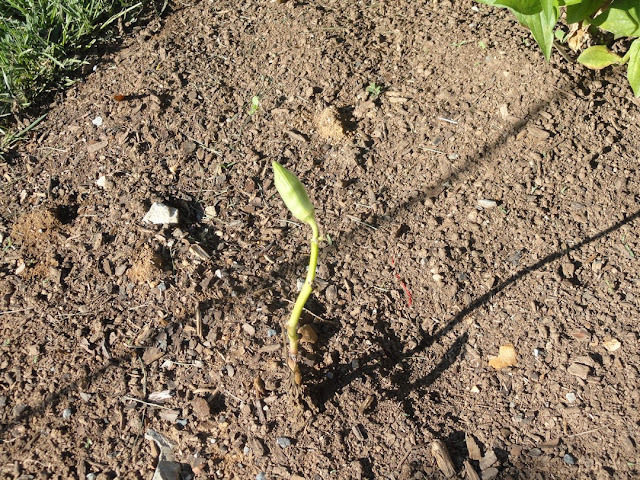 Well, okra hates to be transplanted. The transplants immediately dropped all their leaves and flowers and I felt sure they were dead. The smaller plant never did regrow any leaves, but its flower must have been fertilized, because soon a small pod started to grow right at the top of the plant. It as though the plant knew it didn't have enough energy to regrow leaves and so it decided to pump all its reproductive hopes into the single pod. The larger plant meanwhile has regrown some nice healthy-looking leaves, but has not yet put out any pods. 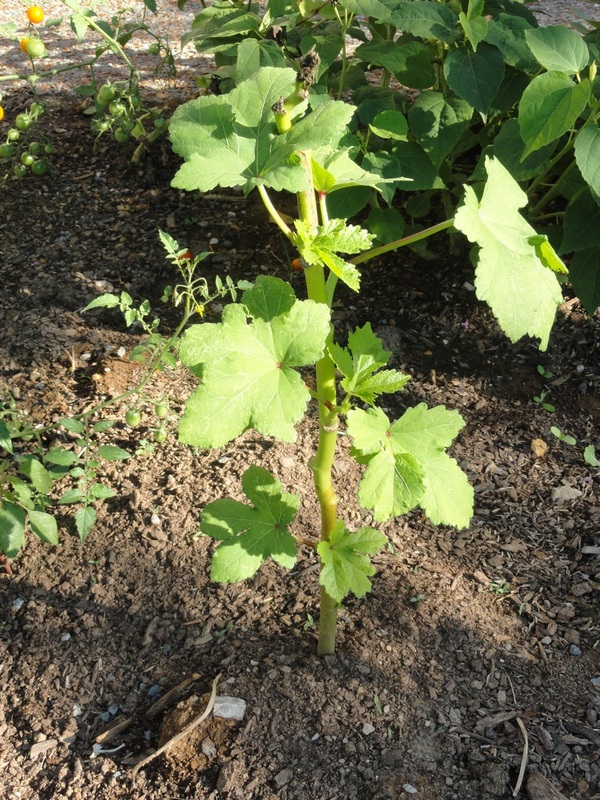 Love these fresh green leaves on this transplanted okra plant! I was just impressed by the spirit and the perseverance of these okra plants, particularly the smaller one. And I will celebrate that perseverance by savoring the one okra pod when I eat it tonight. I'm hoping I'll do better with okra in 2013. See whether that hope pans out with free email updates. I have a few small, very small, plants (perennials) that have persevered, not much more than just surviving. I marvel at these poor little babies that haven't thrived, but at least persevered.